Wyoming is known for its open land, fresh air, and ranch living. In years past, living in Wyoming was difficult because it was so remote. Journeys could take months and sometimes years. As one of the largest states in the U.S. in terms of land mass, it is also populated by the fewest number of people. Wyoming is very large and very spread out. For that reason, the trucking industry has largely been a godsend to the state. It provides Wyomingites with necessary goods that we otherwise wouldn’t have. But the trucking industry does not always operate in accord with federal and state regulations. Sometimes drivers rush to meet deadlines. Other times they’ve been on the road for too long. In some cases, they have not been properly vetted by the companies that hired them. There are times when a trucking company doesn’t properly inspect its trucks before sending them off on a journey. Any of these actions undertaken by trucking companies can result in accidents on Wyoming’s highways – often with tragic and life-altering results. If you been injured in a Wyoming trucking accident contact us now. Since drivers are expected to be licensed before operating a tractor-trailer and because they are operating such a massive intimidating vehicle, they are held to a higher standard than are others on the road. 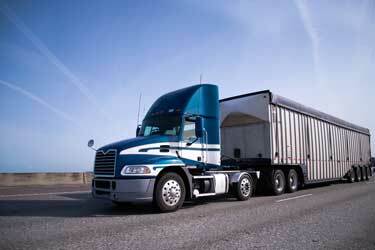 Trucking companies are expected to vet their drivers and ensure they have the proper credentials. They must follow federal regulations governing the trucking industry as well as the rules of traffic. In cases where a driver causes an injury to another motorist, the trucking company is responsible for the damages. In other words, they have what is known as vicarious liability. The government also requires that trucking companies carry large commercial insurance policies in the event that their drivers injure or maim someone in an accident. If you’re injured by a truck driver, it is this policy that you will be making a claim against. All insurance companies have a fiduciary responsibility to act in the best interests of their clients. This means paying you as little as they can get away with when you file your claim. This includes blaming you, at least partly, for the accident. It means exploiting ambiguities in the police report or physical evidence and interpreting it against you. If you have been injured by a commercial truck, you’re in for a fight to see that their insurance company honors the full value of your claim. In the same manner that the trucking company represents the interests of their policyholder, hiring a personal injury attorney ensures that there is someone looking out for your best interests. Most folks find themselves ill-equipped to deal with the style of negotiation and the tactics used by insurance companies to devalue your claim. They will blame you for the accident. They will attempt to prove that your injuries aren’t as severe as you’re claiming. In cases where there isn’t sufficient evidence to support your claim, the insurance company will turn to stone and not pay out a dime. Your attorney’s job is to gather the evidence required in order to leverage the insurance company into paying you a fair settlement. This requires investigating the accident, attempting to recover any video surveillance that may be available, and talking to witnesses if there are any. Insurance companies do not want to see a case go to trial. Trials are expensive and the risk of losing can increase the insurance company’s expenses quite a bit. Our attorneys will prepare your case to be trial-ready in order to leverage the insurance company into offering a fair settlement. Those injured in accidents with commercial trucks are entitled to recover damages related to their medical expenses. In addition, you can recover damages related to lost wages or a lost job. These are considered “economic” damages. In other words, they’re damages related to some economic loss that you have suffered. You are also entitled to collect “non-economic” damages. These include damages that cannot easily be quantified. Damages like pain and suffering and emotional trauma qualify as non-economic damages. A good personal injury attorney will see that you are compensated for both your economic and non-economic damages. The Olson Law Firm represents those injured by commercial trucks and 18-wheelers. Whether your claim is settled with a trucking company or whether you need a trial to prove the trucking company’s liability, the Olson Law Firm promises to treat your problem and your injuries as if they were our own, and will make sure that you are compensated for your injuries. Don’t let the insurance company bully you into a low settlement. Give us a call or talk to us online to set up an appointment today.